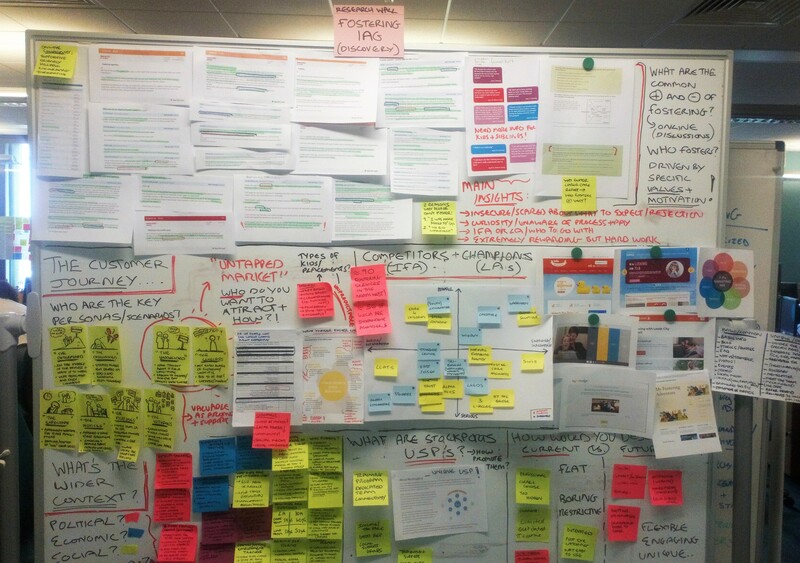 Previous blogs have mentioned our move away from a distinct digital programme to an agile organisation harnessing digital and other tools to meet the needs of our users in the most cost effective way. 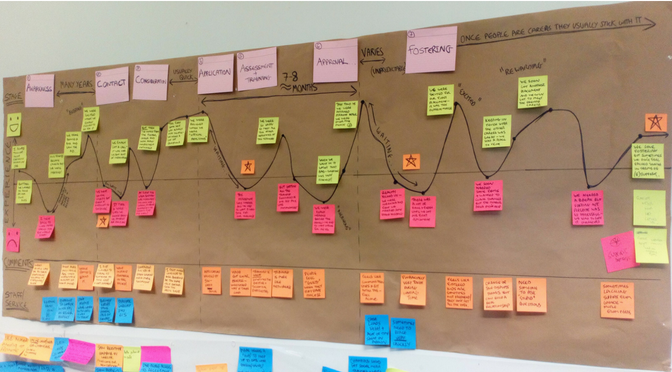 We have made significant progress in improving the relationship between IT and services and as collaborative teams we work together on the improvement of user journeys and jointly prioritise work. 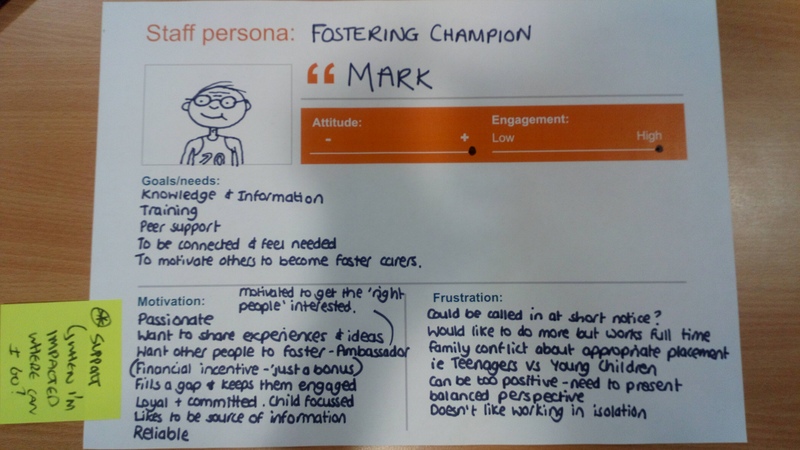 A few months ago, the Digital by Design team started working with Stockport’s fostering team (part of Stockport Family, the council’s integrated service for children, young people and families.) 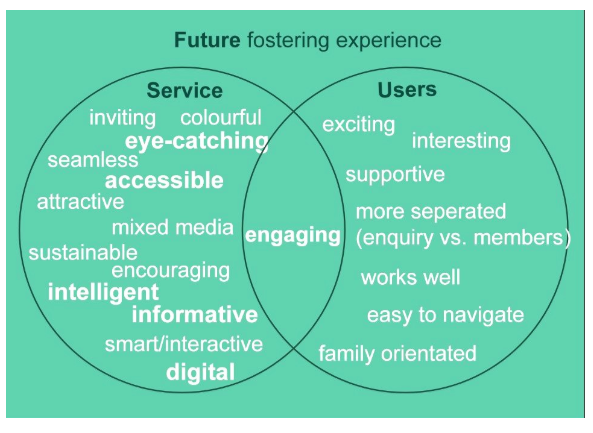 Fostering was picked as a priority area to tackle, requiring an in depth discovery phase and the beginning of a holistic service re-design. Unlike many other services within the council, where residents don’t have the choice to use any other provider, fostering competes with agencies to recruit and retain foster carers. As these agencies usually have a higher budget for things like marketing, it is crucial to not only match their online experience, but to outshine them by aiming to provide the best end-to-end journey with the resources available. Placing children and young people internally is far less costly than involving other external services- even recruiting one more foster carer can lead to considerable savings. Due to the scope and nature of the project, where the user journey isn’t based on one transaction (eg. filling in a form to order a new bin) but on an entire experience which can last for several years, we felt that it needed a more in depth, up front ‘discovery’ phase. This was very different to the usual agile approach used by Digital by Design, where requirements are gathered as you design and iterate. Getting stakeholders on board with the idea of a discovery phase, where one has to embrace uncertainty and trust that solutions will arise from insights gathered was a challenge. However, we emphasised that is was crucial for us to be able to work from a solid foundation of real insights, rather than from assumptions, to ensure a robust solution. This approach also helped us demonstrate that the ‘problem’ was not just the information, advice and guidance (IAG) on the website, but rather a much wider challenge across the whole journey. There were some key questions which had to be answered in the discovery phase in order to uncover these real insights. 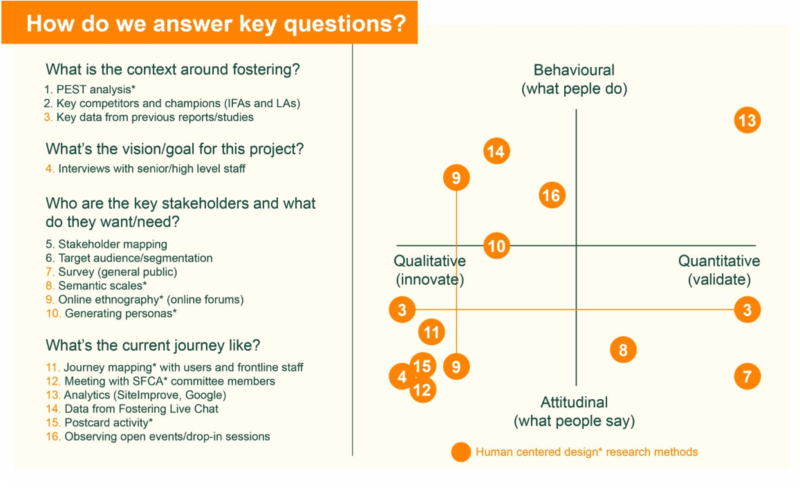 The diagram below shows these questions and the different methods used to answer them (with a stakeholder mapping exercise beforehand helping to identify who could answer them). 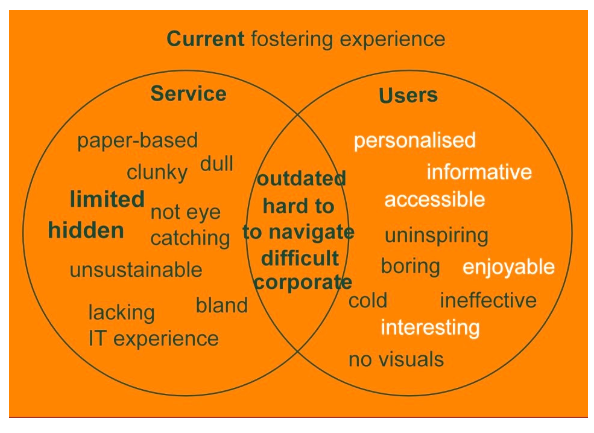 Many come from human centred design philosophy, where the users (foster carers and staff) are at the heart of the project and both behavioural and attitudinal insights matter. This methodology also embraced the other key principles of service design. Additionally, it enabled a new way of collaboration between service design, business analysis and User Experience (UX) roles. To avoid ‘designing for’ and encourage a sense of ‘designing with’ we engaged the service and other team members at key points in the process. We played back research findings, validated certain things, and generated ideas together (which we will further develop together with stakeholders. The discovery workshop with the service: Playing back key research insights and the current journey map, allocating ‘money’ to gauge service priorities, creating staff personas and their needs statements, ideation/brainstorming, and finally agreeing on an elevator pitch and key success factors as a starting point for measuring performance. The definition workshop with the User Experience team: Diving deeper into personas to capture any overlooked needs, developing and grouping ideas, prioritising by plotting on a user vs. business value matrix (helping us focus on certain ideas first and keep some in the backlog for future consideration). At times it was hard to gather the right people in the room due to busy schedules and high demand on front line staff, but we always seek continuous input and feedback in order to validate, increase understanding, and ensure ownership of any solutions we implement. The above sessions helped us get closer to defining the high level re-design ‘package’ and the roadmap confirming what we would start working on in the next months. This package not only includes digital/online solutions that will be developed by Digital by Design/IT, but also recommends changes to offline interactions, service roles and structure. Keeping service stakeholders engaged and involved is therefore an ongoing element of this process. We will also need to keep the feedback loop with foster carers when it comes to prototyping and testing more specific solutions. Throughout this process we have learned a lot about the benefits, feasibility and scalability of a discovery phase approach beyond the boundaries of this specific project. Having a discovery phase is the right approach, but we will be looking at ways to make it leaner, e.g. involving the service more in gathering research, deciding on ‘essentials’. We will be thinking about additional ways of engaging and feeding back to service stakeholders to account for high workloads. The insights we have gathered and the outputs created (e.g. personas) have proven useful for other projects too, encouraging an even broader view when we start a new discovery phase. Doing discoveries requires a specific mind-set and skillset, not a specific role, so we will keep developing our collaboration across Digital by Design and the service. We will continue to learn as the project progresses into delivery and implementation and will be share our findings with you- watch this space!